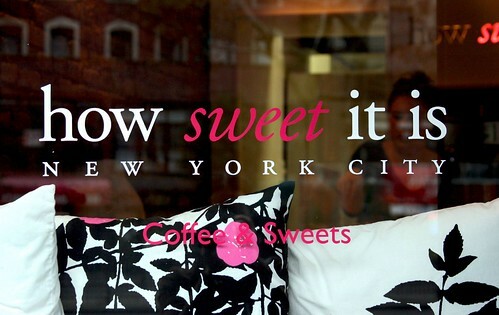 As I’ve mentioned in my previous post, this is going to be about the Lower East Side bakery, How Sweet It Is. I’ve read about this tiny, charming place from the NY Times’ Dining section from Wednesday’s paper. 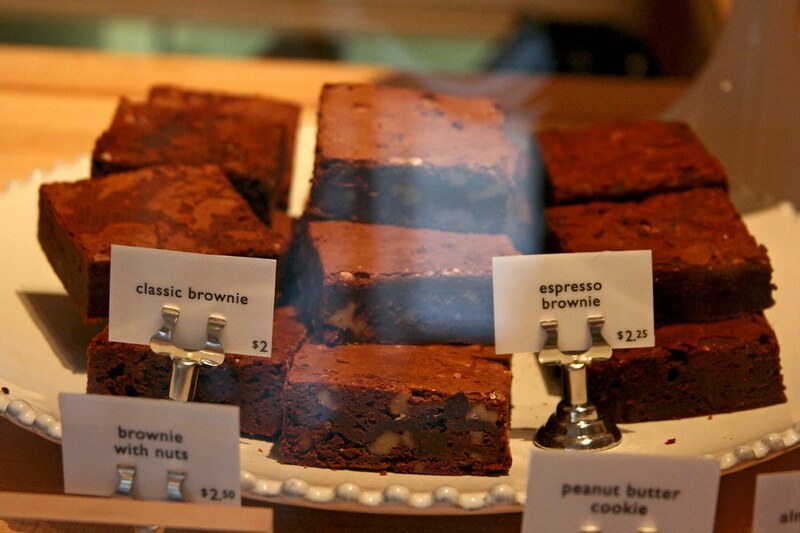 Since I love bakeries, I might as well check the place out on Thursday when my class schedule is more flexible. I first arrived there about 9:15 AM, when the day was dreary, cold, and wet. As I entered the door to this warm, adorable, inviting bakery, I was welcomed by three women: two of them were the co-owners, Ellen and Beth, who were setting up their display case preparing for the morning rush. 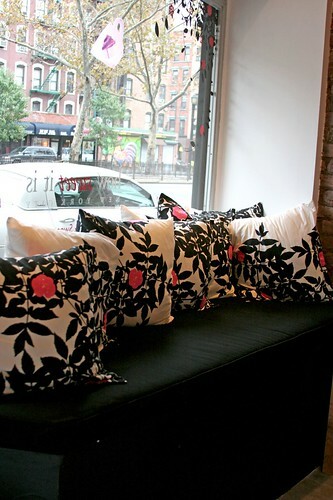 What Beth told me, they are technically in “soft opening mode” since they just had their Friends & Family event last night and after the press they have received from the aforementioned Times article, they decided to open up the shop earlier. After standing in front of the counter for five minutes, I was perplexed in what the heck to eat for breakfast. Beth probably read my mind, she chimed in and guided me what’s available for the morning, which consisted of four different muffins (lemon blueberry, blueberry, cranberry, and another flavor that is blanking at the moment, sorry), the Lemony Cheesepuffs, four kinds of danishes, chocolate chip coffeecakes, sticky buns, rugelach, scones, and a whole plethora of other goodies that would boggle your mind! …Or at least mine. After digesting what was said, recommended, and seen, I ended up getting myself a sticky bun and a Lemony Cheesepuff accompanied with a small cup of their Counter Culture coffee. The sticky bun was tasty. 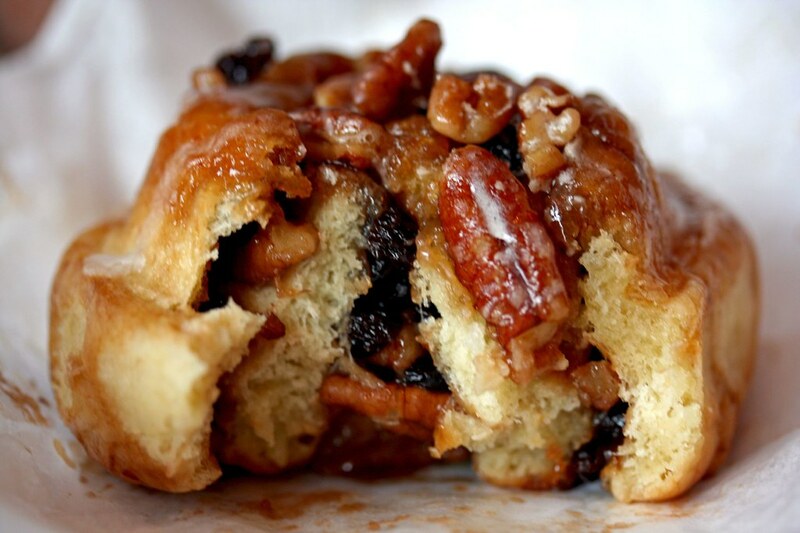 It’s like biting off a buttery, tender, sugar glazed cloud that’s densely swirled with currants, pecans, and chopped walnuts, that every bite a currant or nut rains. It’s sweet (but not terribly) and quite sticky. It’s very different from Balthazar and Bouchon’s sticky buns, which I find very dense compared to this. 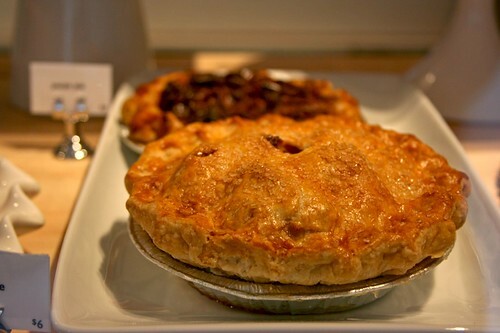 The size is just right for breakfast where you don’t feel like you’re eating a really indulgent pastry for the morning. 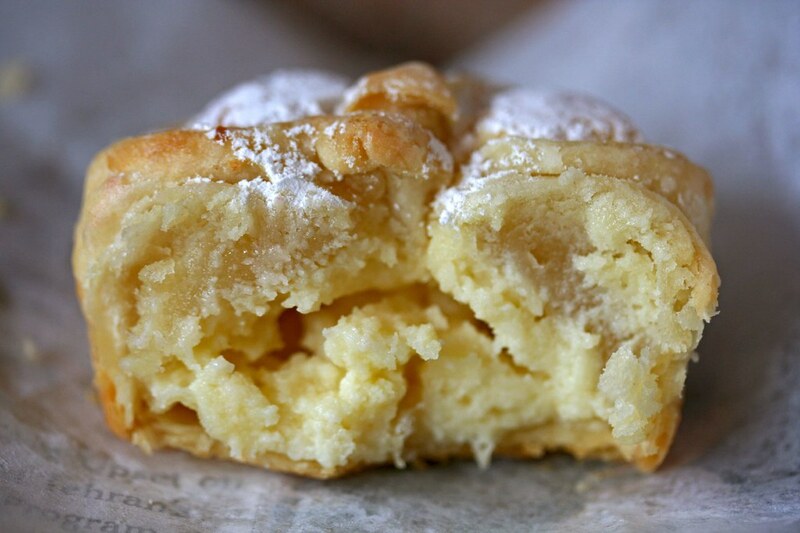 But since me, being me, I went an extra mile of decadence and eaten the dainty lemony cheesepuff. Despite of it’s petite size, it packs a wallop in terms of flavors and textures. 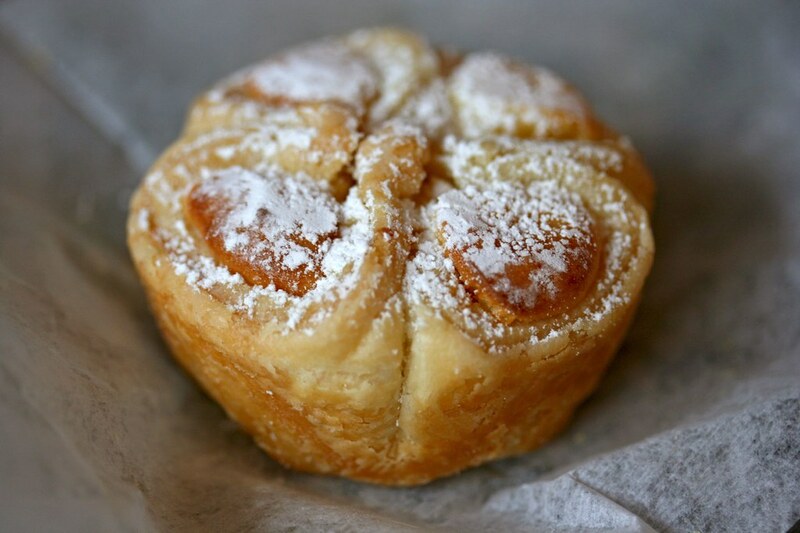 It is light since it is a puff, and it each little crevices are filled with creamy, light, and lemony cream cheese. Wow. I would have gotten a couple of more of these but since my conscience is kicking in preventing me to do so, since I have already damaged my entire day’s diet and have to work out an extra hour to two to compensate what I’ve eaten. I almost forgotten to mention their coffee. It’s lighter than what I normally would love to drink. But it is nicely balanced and has a slightly acidic tone at the end. 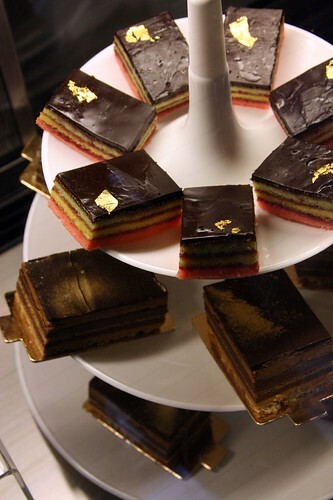 It’s a good accompaniment to their pastries, rather than dominating it. After eating my breakfast, I’ve asked the ladies if I could take a couple of photos of this place. They don’t mind but they wanted me to wait a while since they’re putting up the last pastries for the morning. So, here’s a couple of photos of what I’ve taken during the morning. After taken the photos (a lot more than displayed), I said goodbye to them with lingering thoughts of coming back later in the afternoon right after my government midterm. Oh yes, tests induces me to eat a ton o’ sugar! It’s weird but that’s what happens every time. 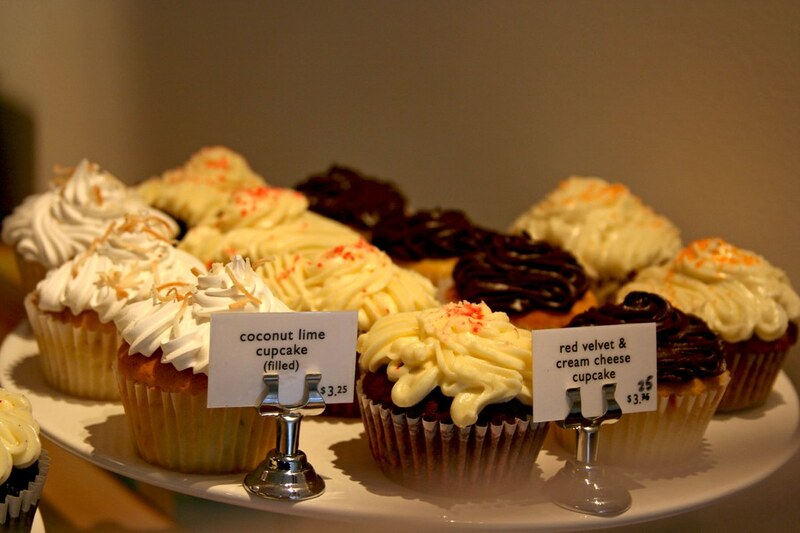 I’ve had one too many cupcakes in my life where cupcakes were bone-dry, tasteless, and terribly sweet that my teeth aches in pain from the frosting. But this doesn’t have any of those aforementioned characteristics. 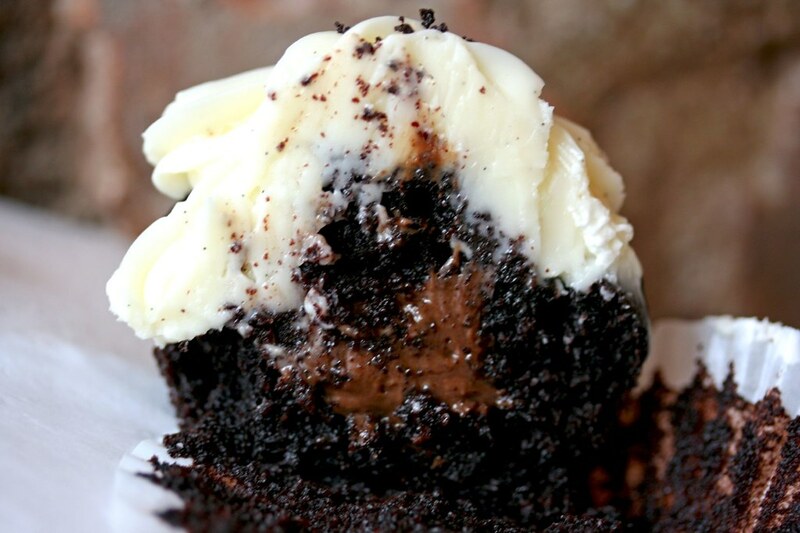 The Devil’ Food cupcake is very light, ridiculously moist (in a good way), chocolatey, and filled with the creamiest chocolate mousse I’ve ever tasted in a cupcake; all topped with light, airy, vanilla buttercream. 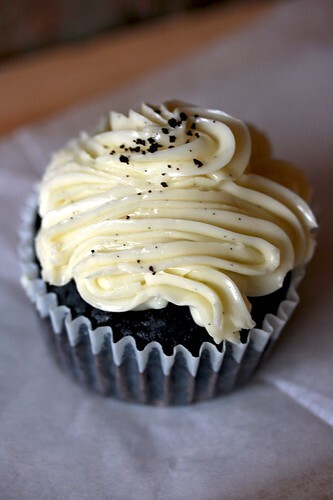 The most surprising thing to me is that the entire cupcake wasn’t cloyingly sweet (especially the frosting), and the cake is very tender and light. This is the closest to the best cupcake I’ve eaten so far. Then I moved to my last sweet of the day, the goat cheesecake. First of all, I felt kind of bad eating this aesthetically attractive dessert. I haven’t seen any bakery decorate cheesecakes like this nor put kumquats in anything, unless I’m eating in a restaurant. Once I took a bite of this cake, this was heaven. The goat cheesecake was very smooth and creamy. The goat cheese was very mild that the candied kumquat just took over and imparted its sweet, tart, citrusy tones emanating on my palate. 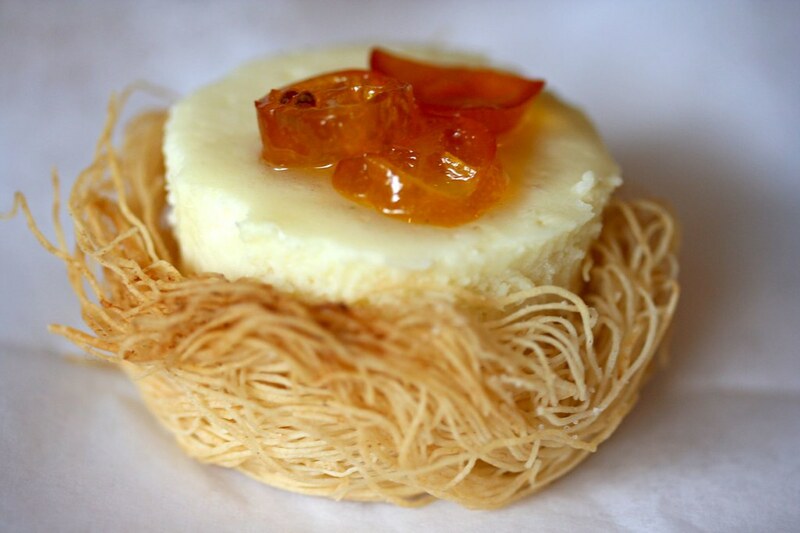 The kataifi (which is shredded phyllo dough) nest was an interesting take on the typical graham cracker cookie crust. It’s very delicate and gave the cheesecake an ethereal brittleness, if you will, to the cake. If anything and everything I’ve tried from this bakery, this is my favorite by far. 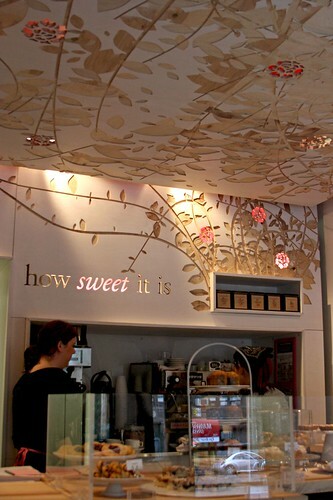 I’m in love with this bakery: the wonderful, friendly people who work here, the unique pastries and desserts, and the shop itself is so cute and welcoming! 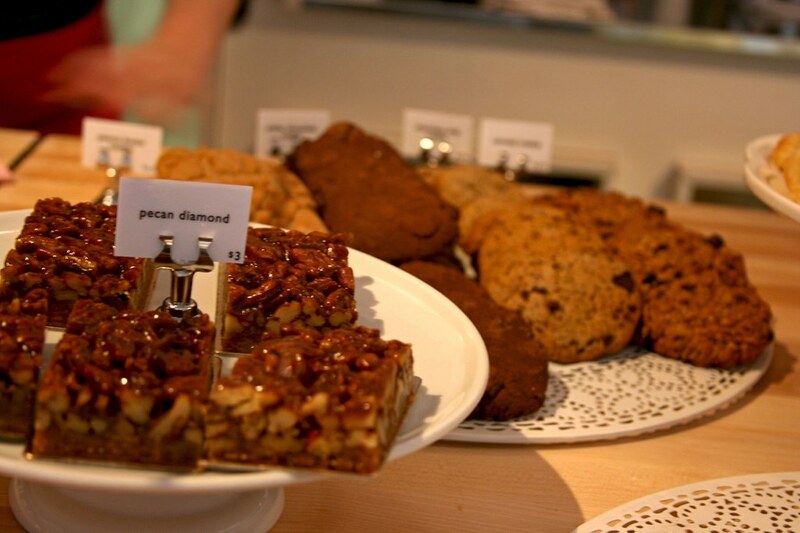 This is a great bakery and it’s a welcome addition to the neighborhood. It’s truly a gem. I just wish I lived closer…well, maybe not, before exercising is an afterthought. I would let my brain unwind but it’s not going to happen for a while since deadlines and tests are arriving in a few days, so I can’t really hold it off unless everyone’s willing to wait another two weeks where my tests and papers are done. 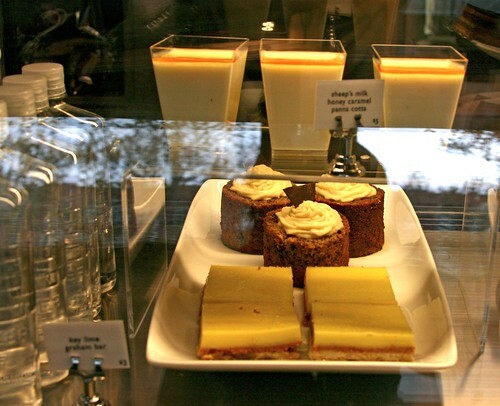 They are pricey, just like Bouchon but the atmosphere is so much more inviting and their pastries are like gems! And it’s quite inventive (as in flavors) as well. 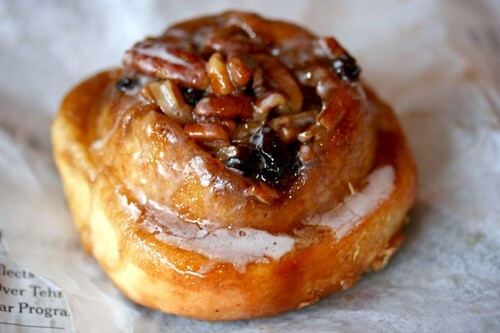 I had my browser on this page, scrolled to the sticky bun picture and then I went to get something. I turned around, and seriously, the sticky bun looked like a FACE. I mean it, clear your mind, turn around fast and look at the bun from 5 feet away. The icing is like a big grinning mouth, and the currants bunched together in the middle thing is the nose. And the smaller currants are the eyes. this post makes me want to be a pastry chef. Your pictures are beautiful enough to be in gourmet magazine! Dana: Oh jeez, you have one vivid imagination! But as I really did what you told me, I could see the nose…very unintentional but cool! Ah, I want to be a pastry chef, too… Even though I’m taking a very different route as a “real” career. Thanks for the compliment! :D I really appreciate it. wow, i’m sold. 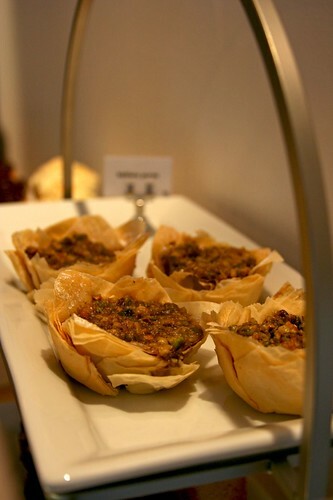 great pictures and descriptions of the desserts. 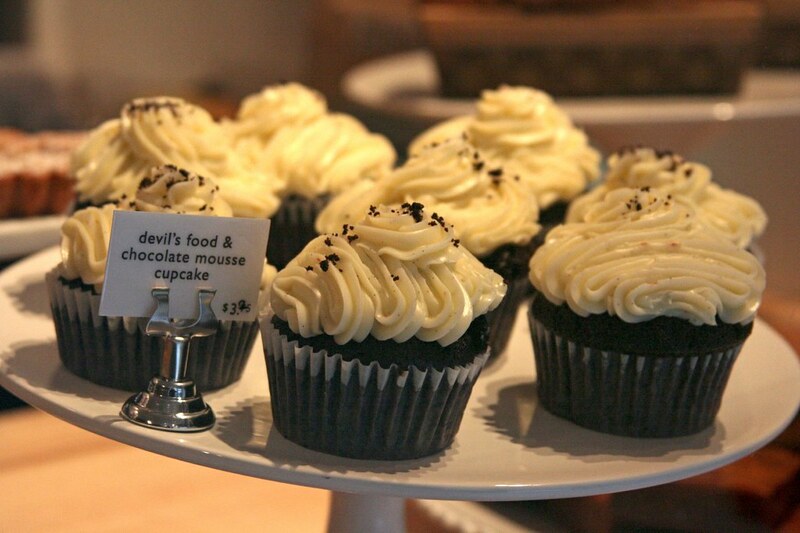 i really want to try that cupcake now! I walked past this place last weekend and while it was super-cute, it is on a rather odd and deserted block, despite being right on a two lane street. I hope people show up, as there doesn’t seem to be much foot traffic. I was also afraid to go in as all I could see from the street was a table set for 4 places. I’m salivating after seeing that lemony cheesepuff, and that nest is really interesting — what’s it taste like? Fen: Um, I guess my metabolism is working with me? Thankfully, I’m not huge…yet. I’m buffering it a bit by working out at a gym. The nest is the goat cheesecake. Please re-read that paragraph (two below the photo). If you don’t want to do that, think of it as a normal cheesecake (miniature sized) with a sweet-tart kick from the candied kumquats. The nest is made of shredded phyllo dough that makes the crust ethereal rather than substantial like a graham cracker crust. Very delicious indeed. love your blog and photos! the lemony cheespuff haunts (delightedly) my dreams and i’m wondering where to start recipe-wise in tryig to recreate such a tasty morsel. Any sage advice or ideas you care to share? much appreciated! 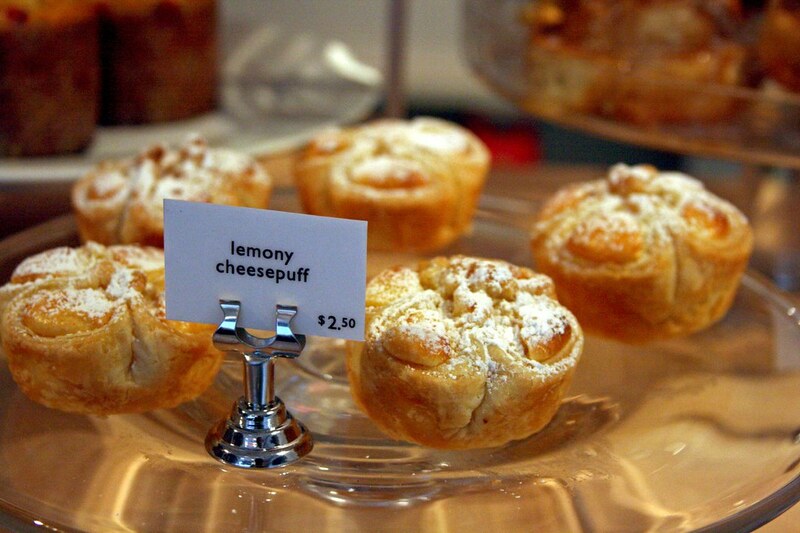 The lemony cheesepuff is very dreamy indeed. I don’t know where to start exactly… It’s not really a normal puff pastry and it’s not a bread/bun either. I wish I knew, but I don’t unfortunately. Sorry! thanks anyway. at least i’ll know where to go the next time i’m in NYC. happy holidays!